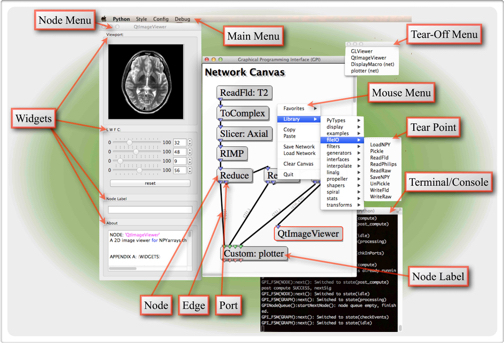 GPI is a development environment for scientific algorithms that provides a visual workspace for assembling algorithms. Algorithm elements (i.e. nodes) can be linked together to form a flow diagram. Each node is executed according to the hierarchy of the diagram. This document provides information about configuring and navigating the user interface as well as extending GPI through the development of new nodes. The sections Configuration and User Interface will aid in getting GPI setup and will provide an overview of the UI visuals, keyboard and mouse controls. The GPI Node Developer’s Guide is meant to serve as an overview of the node development process as well as introduce the code elements that will be required in a complete node code. The Node API and Widgets sections are reference pages that provide the complete parameter sets, methods, and functions required to generate a complete node. The PyFI C++ API section covers the use of the PyFI libraries in extending Python with C/C++ code.